Today in our quest to find more out about habitats. We discussed that there are different types of habitats. I thought we would get through all of the habitats in one literacy block. Boy was I wrong! I then introduced the students to the idea that there are different habitats and different sets of animals live in each habitat. We talked about the five major habitats, e.g. arctic, desert, ocean (coral reef or tide pool), rainforest, and savanna. 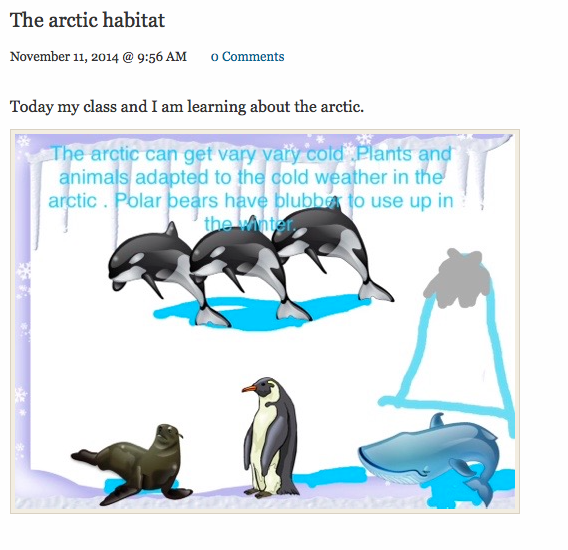 What types of animals live in the arctic habitat? Ultimately, I wanted students to understand that each habitat contains certain characteristics. I then handed out the iPads and told my students that they could draw and annotate a picture of an arctic habitat with the information they learn from the video clip I was going to show them. 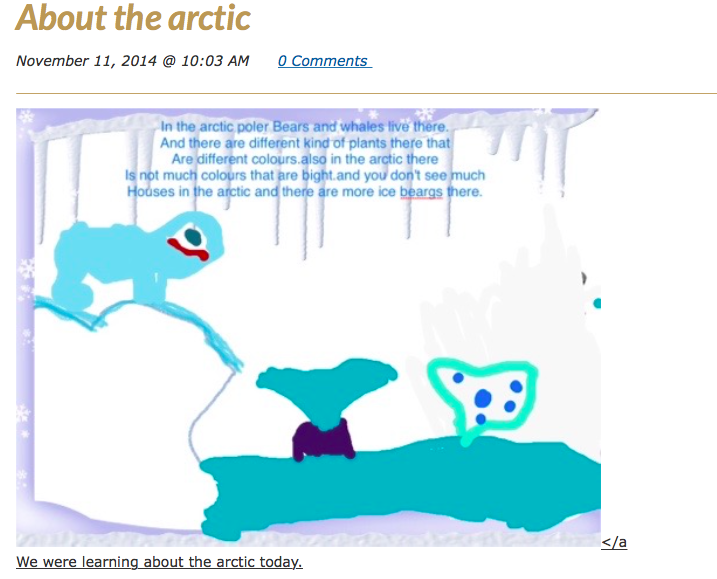 I then showed a video from brainpopjr about arctic habitats. We actually watched it twice, once to watch it, then I played it a second time as they finished their pictures. When they were finished their picture, they saved it to the camera roll and published it to their blogs. Due to how long this activity took, my teaching partner and I have decided to break the kids into groups and give each group a different habitat to learn about tomorrow. (brainpopjr has 6 different habitat videos) We will then have the groups create something to show their learning on the habitat they research and share it with the class. We are starting a new Inquiry Unit on Animals and we are in the "Immersion phase" of the inquiry circle. Which means, I am inviting curiosity, teaching background knowledge, and inviting students to wonder about different animals. One of the things that I want my students to include in their Inquiry learning is what their animals habitat is. I also wanted to introduce them to a new graphic organizer called the RAN strategy, which stands for Reading and Analyzing Nonfiction. A RAN chart is a lot like a KWL chart. However, the students start with prior knowledge then after reading or watching something about the topic they move their sticky to a new column based on if their information was right or if it was a misconception. 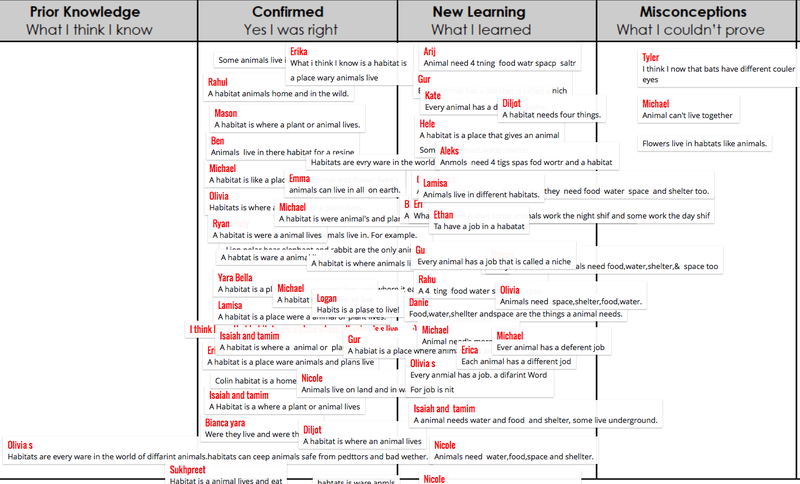 The chart also still contains a New learning column as well as a Wonderings column. 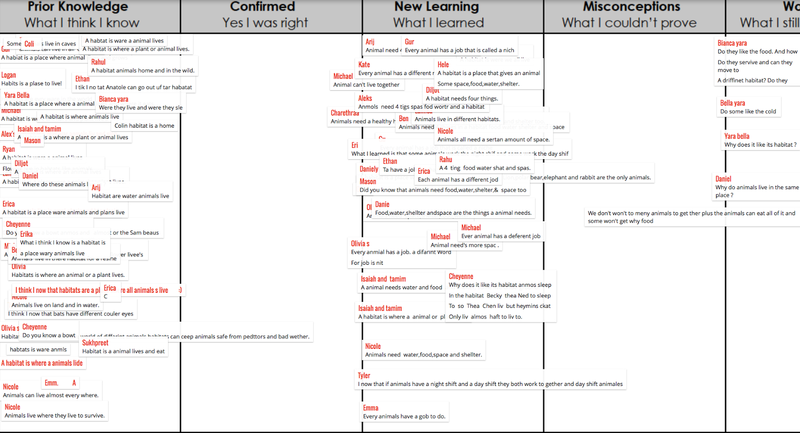 I took a screen shot of part of a RAN chart and used it as the background to the padlet wall. See what a padlet wall is here. I then chirped the url of the padlet to the students iPads and had them fill in what they thought the word habitat meant. See what chirp is here. We then watched the following habitat video and I had students fill in the the New Learning column. Tomorrow I will be giving students a piece of writing on habitats at their reading level. I will have my students use the RAN strategy using sticky notes and a graphic organizer. 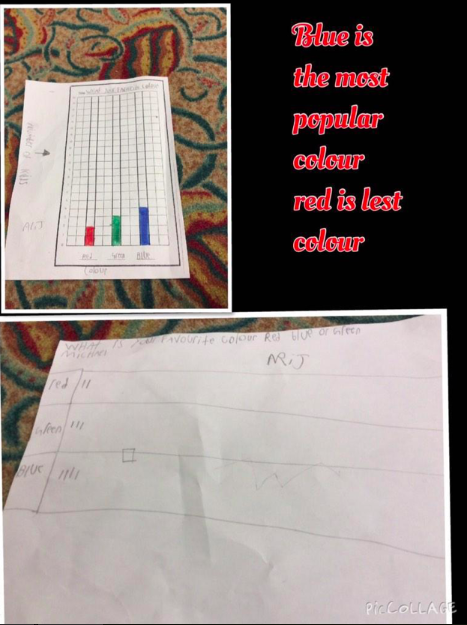 Here is a link to some RAN graphic organizers I found http://www.myteacherpages.com/webpages/mkiva/files/R.A.N%20Writing%20Frames.pdf from Marianna Kiva's website if you wanted to try it out in your own class. I am not a fan of worksheets or homework. I think reading is the most important homework for my students and my own children. 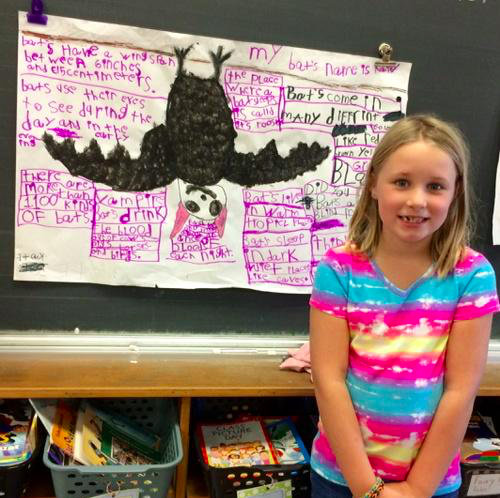 My students just finished their inquiry projects about bats. 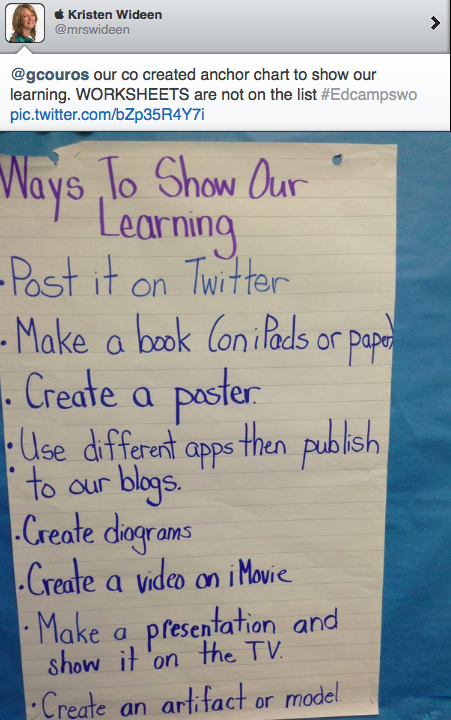 We created the list above just a few weeks ago before my students chose how to show all of their research and learning. I find when you give your students the choice on how to show their learning you get better projects and happy and engaged children. I am going to share some of their projects, however, I also want you to know that I feel that the process is much more important than the product. I don't correct their spelling or have them redo their posters if there is incorrect information. This is THEIR work, not mine. We talk about the content and feedback after they present. I am always amazed on how much they know about their inquiry when they get the chance to present. It is always far more than what is in their book or on their poster. Presenting usually takes two days. 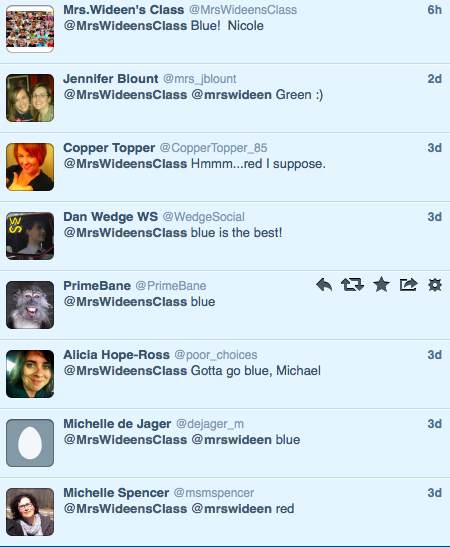 I split the class in half. Half the class stands by their projects, presents their information and answers questions. While the other half of the class listens, asks questions and takes notes on new information they learn. These projects not only cover science and literacy curriculum but also are rich learning tasks that promote critical thinking, presentation skills and self-confidence. I am positive that worksheets and huge amounts of homework do not.